BAE Systems (News - Alert) unveiled its 360 Multifunction Vehicle Protection (MVP) Sensor as part of the company's integrated vehicle protection system (VPS) suite, which provides improved visibility, situational awareness, threat warning, and countermeasures to protect armored vehicles and crews. The 360 MVP Sensor combines four high-definition, extended-view multifunction cameras that serve as the eyes of the VPS, providing crews with sharp images of the battlespace around them and quickly detecting and tracking threats - from ground troops and small arms fire to aerial systems, impovised explosive devices, and missiles. The sensors provide 360-degree visibility and threat warning capabilities during the day, at night, in adverse weather, and despite challenging natural and manmade battlefield conditions including fog, dust, and smoke. "Our approach is different. We're using mature, integrated components to provide a modular and affordable system for protecting armored vehicles that's tailorable to the platform, mission, and budget," said Ryan Edwards, BAE Systems' business development manager for Soldier and Vehicle Electronics. "Our vehicle protection system lets crews see first and act first, helping them complete their missions." The 360 MVP Sensor provides early threat warning that helps crews quickly detect, recognize, identify, and track potential threats. It can be integrated with and cue non-kinetic countermeasures - including BAE Systems' RAVEN - and kinetic countermeasures to defeat threats, shortening the response chain and reducing the cognitive load on crews, improving mobility, lethality, survivability, and overall mission effectiveness. 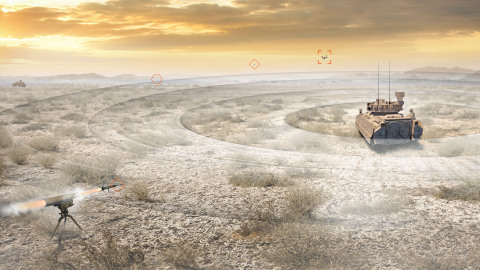 BAE Systems' VPS provides an integrated, layered defense for armored vehicles that builds on the company's extensive experience developing sensors, image-processing technology, and aircraft survivability equipment - technology that has been proven through millions of combat hours. Development of BAE Systems' vehicle protections systems is conducted at the company's manufacturing center of excellence in Austin, Texas.